This additional content will unlock the new dungeon “The Inferno Hollow” which has 60F. In “The Inferno Hollow”, all floors are made up of one room. By making good use of “Dragon Area”, let’s breakthrough dangerous situations! Download now to get access to the Aquaman Movie Level Pack 1 & 2! Control your favourite characters based on the DC Aquaman film! Battle as Aquaman and rule the underwater kingdom of Atlantis! Level Packs include Aquaman, Black Manta, Mera, Orm and more. Lightseekers Gems are an in-game currency that can be used to buy items such as booster packs, chests, cosmetic items and more! Yano Market Clothing: Uniform worn by those who work at the Yano Market. Kid’s Yano Market Clothing: Normal Yano Market Clothing made in a kid’s size. Kid’s Yano Market Summer Wear: A summer outfit for children based on the original Yano Market Clothing design. Get the two successful and award-winning games Ethan: Meteor Hunter + Inside My Radio in this discounted bundle! Kizuna Encounter is a fighting game released by SNK in 1996. Create a team of two fighters and use weapons and your fists to win in single-round sudden death tag-team matches! Experience the feel of an advanced battle system that pairs mid-battle character change-ups and easy commands leading to rush combos! In Apocalipsis Wormwood Edition the static woodcuts from the Middle Ages start living their own life, but the medieval philosophy and occult symbolism go beyond the visuals and inspire the story itself. In this game, the music and the graphics work in perfect tandem to immerse you in this bizarre, dreary world. Wormwood Edition also contains “One Night in the Woods”, which is a prequel to the story known from Apocalipsis: Harry at the End of the World. Create & play! New dungeon RPG “BQM -Block Quest Maker” has come to Nintendo Switch! BQM enables you to create your very own dungeon RPG, packed with puzzles and traps. Secret doors, falling rocks, strong mobs – challenge them all and level up. What lies within the box? Unveil the secrets or… create them! But wait. Isn’t the stage design difficult? No, not with this maker! With simple controls of “construct” and “connect”, it’s easy like playing with blocks. Commands may be easy, but dungeons you create can be as canny and deadly as your imagination dictates. Just use your head and BQM’s traps and gimmicks. Be it puzzle, action or story – which dungeon will you make? Share maze of your design with players all around the world and challenge them to beat your wit. Bubble Shooter Deluxe (DX) is a classic bubble shoot game. This addictive classic bubble blast match-three game comes with clean and modern graphics, hundreds of great challenging levels and some nice special items for better game experience in harder levels. Bury me, my Love tells the story of Syrian refugee Nour and her husband Majd, as Nour undertakes a perilous journey to safety in Europe. Bury me, my Love is a Text Messaging Adventure game about Nour, a Syrian migrant trying to find her way to Europe. Her husband Majd, who remains behind in Syria, communicates with Nour through a messaging app, advising her as best he can so that she reaches her destination safely. One of the most original game concepts is now available on the Nintendo Switch! Clock Simulator is a minimalistic rhythm game. It puts the player in the role of the clock itself to explore the concept of time in a whole new way and offer challenge, relaxation, or plain and simple fun. All that a clock needs to do is to advance precisely once every second. Second, after second, after second, after second … Sounds simple enough? But could YOU take over and do it? Calm down. Relax. Focus on your inner rhythm. Click once a second. Every second. You are the clock. Combat Core is a 3D arena fighting game sporting a colourful mix of modern aesthetics and futuristic cyberpunk. Fighters from across the galaxy have gathered to compete in the Combat Core League! The fighting mechanics focus on fast-paced combat, strategic use of your environment, and weapons in the arena. Fight against challenging AI or your friends, online or offline! A whimsical hand-crafted single-player adventure filled with a variety of puzzles and exciting platforming. Watch your step, there are many dangers to overcome! Discover a delightful world, inhabited by the playful and usually helpful Mandragora. Journey from lavish beaches, through ancient temples, mountain tops and caverns filled with forgotten Mandragora technology, and more. A vast and ever-changing soundtrack, beautifully blending the themes of the world and underscoring Elli’s adventure. Traverse circles in a mysterious ocean world, and search for your lost memories and your body! Checkpoints are spread out generously throughout the stages, so that even beginners can play the game, whereas special challenges like the Time Attack mode or clearing the whole game without dying ensure that also game veterans and achievement hunters have a good time. The game is played simply by rotating the map’s outer ring. Bounce the ball and destroy the gems within the time limit. If you manage to destroy the Prism Gem, you will go into Fever Time. This will trigger an opportunity to destroy a Bonus Gem to get bonus points! Try to improve your score by upgrading the ball and by using items! Something’s wrong with the gravity, something’s wrong with the laboratory and the whole world! Magnetic anomaly, weather anomaly, gravity anomaly – oh, I’ve done a mess… Let’s fix it. Help me in collecting all vials and all parts of my time machine to save the world. Rescue my lost friends – scientists and celebrities! Grab Lab is a crazy mix of puzzle and arcade game. Complete all unique levels – from simple to extremely advanced and demanding. Save the world – fix the gravity and rules of physics. You and your friends assume the role of JUMPERS, and blast your way through subterranean alien hives in chaotic run-and-gun 2D platforming action. Up to 4 Players band together (Local Multiplayer) to kill aliens, avoid traps, collect treasures and lost relics. Win the final battle against the hive queen to save the galaxy! Action Platforming: Engage swarms of aliens in frenetic combat. Avoid traps, withstand ambushes, discover treasures, rescue survivors, and more. Ten-pin bowling, candlepin bowling, duckpin bowling… All kinds of popular bowling styles are included in Basic Mode. Play with 4 players and 1 Joy-Con! Try fun game modes like split screen, team matches, no gutters, and more! Also includes Variety Bowling where roulette decides the rules! The roulette wheel will have you bowling with strange items like a curling stone or a soccer ball! Momodora: Reverie Under the Moonlight, the critically and publicly acclaimed action-platformer from Bombservice, has finally made its way to Nintendo Switch! Lead Kaho, a priestess from the village of Lun, as she seeks an audience with the Queen of Karst who can surely lift the curse from the land. 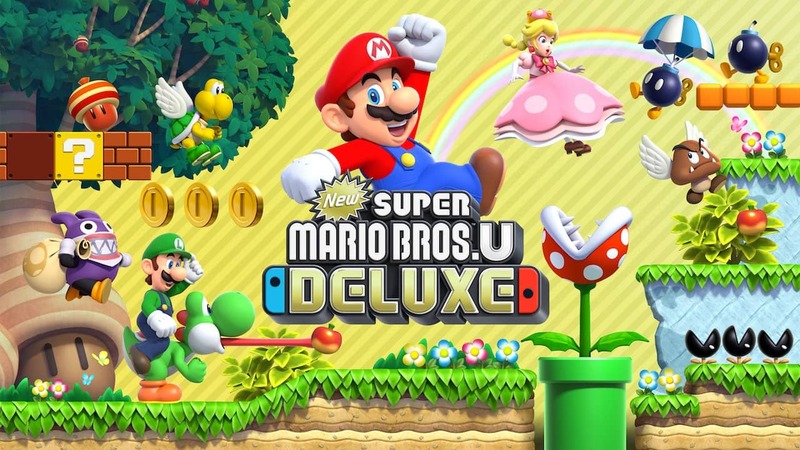 Run, leap and stomp your way through more than 160 2D side-scrolling courses in traditional Super Mario style with New Super Mario Bros. U Deluxe for Nintendo Switch! Up to four players can work together to grab coins and topple enemies on their way to the Goal Pole, or see who can nab the most gold in frantic, friendly – and above all, fun – competition! The 3D driving game that launched a legacy returns on Nintendo Switch! Featuring new motion controls, newly added music tracks, and a new ranking system. Speed through the streets of SEGA AGES Out Run, the award-winning title that paved the road for the racing genre. Your favourite stages and soundtrack are back. Do you have what it takes to beat the clock? Stomp tricks, play against your friends, and make the dream of becoming the greatest boarder of all time come true. Challenge your friends with split-screen multiplayer. Try to keep your high scores on top of the worldwide leaderboard in Arcade Mode, or find the best solo lines in Career Mode. Feel like a pro with our easy-to-learn intuitive Nintendo Switch controls, but there are hours of challenges and tricks to master. Celebrate the 10th anniversary of Tales of Vesperia and the return of this fan-favourite with the Definitive Edition! A power struggle begins in a civilization dependent on an ancient technology, the blastia, and the Empire that controls it. The fates of two friends travelling separate paths intertwine in an epic adventure that threatens the existence of all. Dive into the Definitive version of this game with updated full HD graphics, brand-new music tracks, exciting mini-games, bosses, and a collection of unreleased costume DLC! We want players to solve puzzles, to compete with others while doing so, and to play – everywhere and with everyone. Pair up all the matching sockets on the board by drawing continuous lines, without crossing over other lines or branching off. Cover the entire board while connecting all of the sockets! Keep an eye out on time-limited stages, or on the limit on moves you can make per stage! Design a towering mall of mega proportions! Attract droves of customers and elevate yourself to 5-star status in this mall management simulation game! Add anything from fast food joints to sushi restaurants, stairs and elevators–even a heliport–all with a touch of the finger! Hey there all you dirt bike fans welcome to the world of Old School Racer, race through a 2D retro world, across 60 unique and amazing levels with twists and turns everywhere. We have a brand new mechanic added to the game……MORPHING! The world will literally morph at times creating extra paths, platforms, jumps and drops to help or possibly hinder your performance. Gravity modifications once again returns, redefining what you will call the ground, soon you will be racing upside down, up sheer walls or flying through the sky.